* While quantities last, MS6000's will come with a Dell PC, LCD Monitor, Keyboard, Mouse and pre-installed with Minolta MS6000 drivers and software; a complete turn-key system! 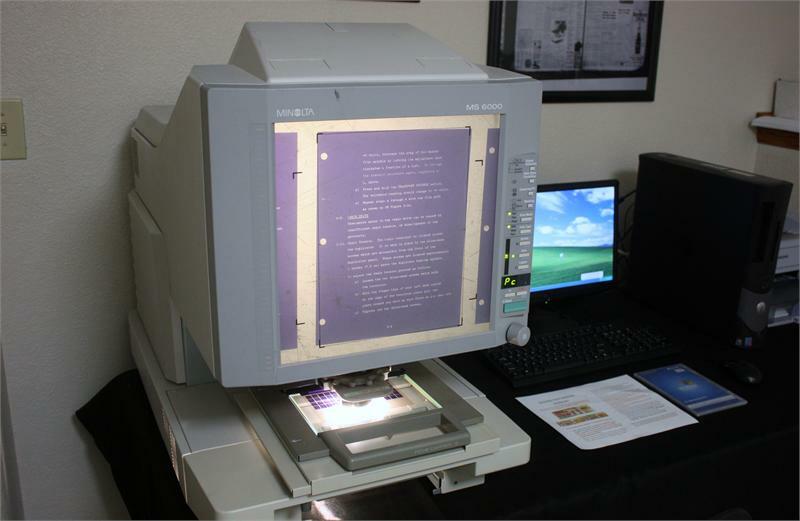 The MS6000 is a powerful digital imaging system that is also easy to use -- and makes your microfilm and microfiche information more powerful by combining the ability to read on screen, print on paper, and scan and digitize for electronic distribution. We have currently have several Pre-Owned Minolta MS-6000 systems in stock with very low usage. Choose your desired Zoom Lens, Film Carrier. Each unit comes equipped with a Dell PC, LCD Monitor, Keyboard, Mouse and is pre interface kit and software so you can scan images directly to your PC. WIth the PC kit, you will utilize your own network laser printer for document printing. Shipping on a pallet by truck is additional and typically costs between $195-$250 in the Continental U.S.
A bright 12” x 12” anti-glare screen gives you a clear, detailed view of your micrographics images. You?ll be able to load a wide range of film and fiche carriers for microfiche, jackets, aperture cards, 16mm and 35mm roll film, and 16mm film cartridges. You?ll also have two high-speed laser printer options to choose from -- and two MS6000 MK II scanners can share a single printer for greater cost-efficiency. Auto imaging and enhancement features let you adjust image position and alignment, zoom in on hard-to-read areas, enhance quality and trim and mask scan areas. High-resolution PC scanning enables you to incorporate microform information in websites, Emails, faxes and desktop publishing projects. High-speed video connector for fast direct printing and optional SCSI-2 connector for PC interface. ** Shipping via Fedex Freightways on a pallet for $125-225 depending on location. Call with Zip Code for exact cost.